You could spend forever working out exactly how to live a healthy life — the internet is full of hacks meant to help you optimise each little detail. But honestly, most of the benefits of sleep, exercise, and diet come from just doing the basics right. So if you’re feeling overwhelmed, here’s where to start. You can run, lift weights, do yoga, take classes — there are tons of options. Any exercise is better than none, and if you’re feeling out of shape, try doing a little more than whatever you’re currently doing. There are entire industries that sell things to people who don’t have enough “energy.” You could buy their vitamins, gadgets, or motivational advice...or you could just get enough sleep in the first place. Even within each of these domains, pick one thing at a time. Add a cycling class once or twice a week and see how that feels. Next week, find a few healthy lunches and get into the habit of packing them. Take stock of each change after you make it — has this changed things for the better? Would I like to do more? What challenges are in my way? — and before long, you’ll be living a healthier life. I disagree that diet matters more than exercise. 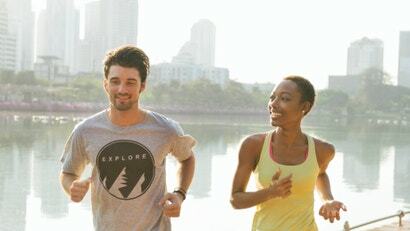 If you dramatically ramp up the amount of aerobic exercise you are doing, eg going from sedentary to running marathons, your weight will drop unless you start eating a lot more calories. And even if you do eat more food, there is still a high chance the weight will drop simply because of the caloric demands of long distance running, cycling eyc. This is even more true if you are obese to begin with and if your body can adapt to the high mileage without breaking down.